As the IBEW has seen in recent years, the population growth of the United States has lead to many commercial and residential electrical projects in order to accommodate for the growth. What the population boom has also done is caused an increase in traffic! 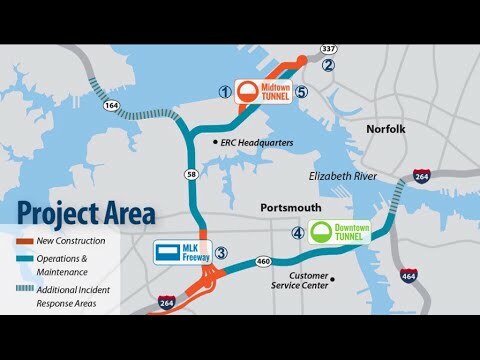 In order to provide a solution to the traffic problems in the Elizabeth River area, IBEW Local 80 is working on the new Elizabeth River Tunnels, the roadway from Norfolk to Portsmouth. Watch this feature now to learn more about the IBEWs role in this incredible project! Welcome to Norfolk Virginia, an area of the country that is rich in history and scenic beauty. And with a sticker price of $2.1 billion, Norfolk is also home to one of the largest construction projects in the U.S. The Elizabeth tunnel river project has been a top priority for the Hampton Roads region for many years. The Elizabeth river separates the cities of Portsmouth and Norfolk that is home to 1.7 million people and it’s home to the world’s largest navel base and several marine terminals. Over the years the region’s population has increased nearly 70% and tunnel usage has gone up by nearly 600%! So, when the existing tunnel and surrounding highway infrastructure could no longer handle growing traffic (6 times greater than it used to be) the Virginia Department of Transportation called on the men and women of IBEW Local 80 to help build the Elizabeth River Tunnels Project. The project is broken into five elements: a new midtown tunnel, the Norfolk Approach, the Martin Luther King Freeway Extension, rehabilitation of the existing downtown tunnel, and rehabilitation of the existing midtown tunnel. When it is complete the average round-trip commute will save about 30 minutes a day. It all translates into broad and lasting benefits to the economy and the lives of those who live and work in the region every day. With this much work the Elizabeth River Tunnels team had specific goals they wanted to accomplish before construction started; among them was to hire the best skilled local labor. Daniel Francis: Project Manager, SKW Instructors “I am from this area so I think it’s very important that we hire locally in the Hampton roads area. It is very important for us to hire local. Susan Ritter: President, Bryant Ritter Hewitt Electric “This project is a highly technical complex project and not just any company can step in and do this. That’s why we are lucky to have Local 80. And what is the benefit of hiring local? Working with that many trades people, and at a point 90 feet under the surface of the water, this project has some unique challenges. When done, the men and women of IBEW Local 80 will have installed over 340,000 ft. of conduit, pulled close to 2 million ft. of wire, and installed over 1,400 lighting fixtures. For IBEW Hour Power, I’m Matthew Walton.